The end of the year is traditionally one for reflection, an arbitrary milestone to look back at what we did right over the last year – and what we did wrong….a time to review what we’ve done to get ourselves closer to our goals. In that spirit, I’ll close out the year with this article. I stumbled across it about ten years ago, and I’ve probably re-read it at least once a year since then. It’s definitely well worth both a read and a moment to reflect. Happy New Year! Catch you in 2013. As the year tapers off to a close, I figured I’d continue with a tradition and list the top ten posts of the year. I know it sounds simple in theory, but much like a simple exercise in Business Intelligence and project metrics, I found myself spending an inordinate amount of time trying to figure out just how to calculate what exactly should comprise the top ten list. As in many circumstances where a client asks a seemingly simple question, this question is actually quite tough to answer. Hence, following the footsteps of many PMs before me, I engaged in the time honored ritual of taking something that should really be quite simple, and made it much more complicated than it actually deserves. For those bloggers out there reading this, take this as a gauntlet thrown down to challenge you to come up with an even more complicated blog rating metric in coming years. First off the list (in alphabetical order). Following that, for those people who are actually interested, a few notes about the methodology. I could have been lazy and simply looked at the total number of hits each blog post received over the year – which is what I did last year. This would have resulted in a front loaded list of top posts, as clearly the posts I published in the beginning of the year would have had all year to accumulate hits, whereas the posts at the end of the year would have only had a few months to accumulate posts. Hence, option #1 would have been front loaded with earlier posts. The second option would have been to take all of the posts and pro-rate them based on the total number of hits divided by the total number of working days since the post was published. This would have been a fair approach – if the overall blog readership had remained static over the year. But the blog readership did not remain static. In fact, I’m happy to report that the monthly traffic on this site is up 100% over the same time period in 2011. Hence, the average daily hit rate per post in the latter half of the year was much higher than the earlier part. This approach would have meant that the latter 47% of the posts were basically freeloading off of the audience generated by the posts in the first half off the year. Clearly, that situation would have been untenable. So I settled on option #3: normalize the number of hits/post (filtered on 2012 posts only) per day; sum the results into a normalized number of hits, and then divide that normalized score by the number of working days since the post was published. It’s quite simple, really. Even simpler when you realize that WordPress offers an API to generate the required data. This ends up generating our data set, which may be downloaded into Excel. In other words….happy holidays and wishing you the best in 2012 and 2013! 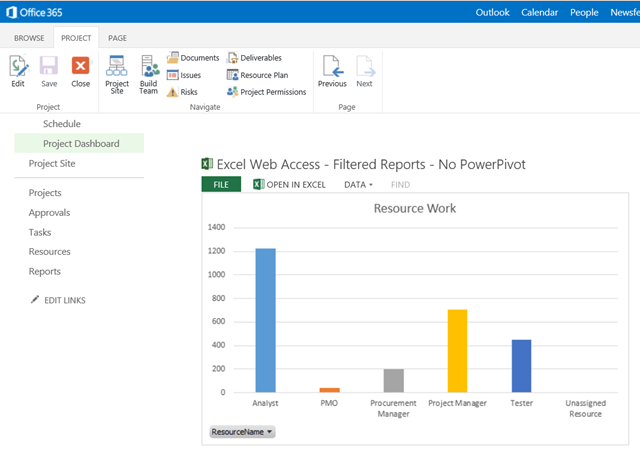 Just wanted to close out this discussion with filtered Excel reports in Project Online with a last use case. In yesterday’s post, I talked about how to create an automatically filtered project dashboard. In this post, I’ll talk about another common example, creating an Excel report that filters by user. I’ll use one of the reports I created in yesterday’s post. This one shows project work, and allows the user to slice by resource name. I’ll add this via an Excel Webpart to a page in my PWA site collection. Pretty much the same as the last exercise. The main exception is that we have a dependency on the User Profile Service being provisioned – which is the case by default in Project Online. When passing the parameter from the Current User Filter Webpart then, we need to select the Name field, and not the user account field to be passed into the Excel report. 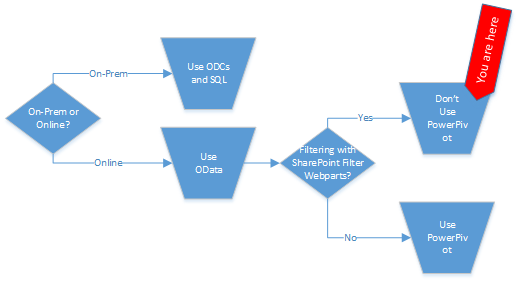 In this post, I’ll continue discussing how to promote parameters into SharePoint and then automatically filter reports using the SharePoint Filter Webparts. Note that this solution should pretty much work both in on-prem and online – with the caveat that you might want to construct your data model differently based on the solution you’re using. Check the last post for guidance on that (and check the bottom of this post to see if things might have changed since I wrote it). Picking up from the last post, I have two OData connections that I will add to Excel. 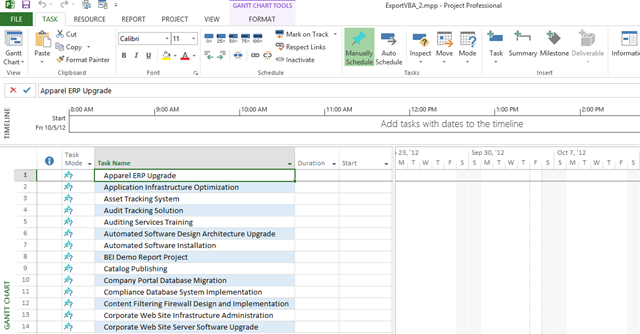 This time, when I add them to the Excel workbook, I select the option to simply add them as tables. ..which yields a workbook with two tables. 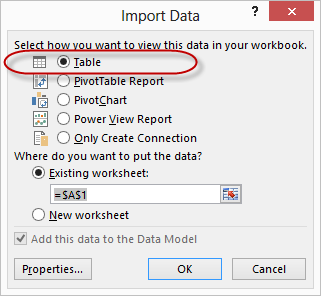 Instead of using PowerPivot, I can then move fields between the tables using a vlookup formula. I’m now going to add a slicer to each chart. I’ll add a ProjectID slicer to the top chart and a Resource Name slicer to the bottom chart. Click on the slicers to validate the results. At this point, I’d also name the charts to ensure we display the correct ones. I load this report to SharePoint. When I save to SharePoint, I select the browser options button and configure both of the slicers as parameters. After uploading to SharePoint, we now can display it. 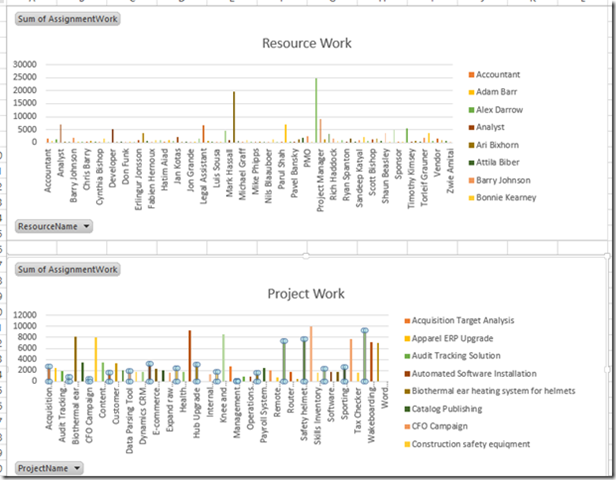 In the first case, we’ll add our Resource Report to a PDP that I’ve created called the Project Dashboard. I add two webparts….one Query String Webpart and one Excel Webpart. 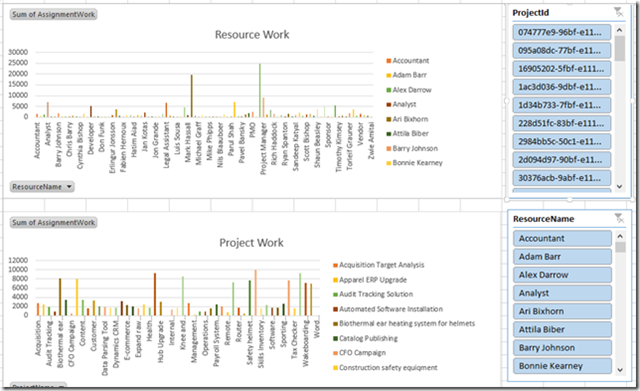 I configure the Excel Webpart to display the Resource Report. …then I configure the Query String Webpart to pull the ProjUID parameter from the URL. The ProjUID is a 36 character identified for each of the projects in the system. Add a connection from the Query String filter to the Excel Webpart. …and I now have a filtered report showing project specific data. …in tomorrow’s post….the same, but filtered by resource name.